UPDATE: What once was the charity autocross has become a Jaguar autocross. We won’t be allowed to run our cars on the course, but we can test drive theirs free of charge. Formerly known as the Portland Historic Races, the Portland Vintage Racing Festival is one of the oldest and longest-running vintage races in the United States, regularly drawing 250 or more competitors from the West Coast and Canada. This 3-day event, organized by the Sportscar Vintage Racing Association (SVRA), gives you an opportunity to see a number of great historic and prestigious cars out on the track and up close and personal. With full access to the paddock area you can check out all of the race cars, as well as get a chance to talk to the drivers and crew members. Festivities will start Friday and go through Sunday, with Saturday night offering extra entertainment with dinner at the track, music by Mitch Ryder & the Detroit Wheels, and a fireworks display! There will also be a number of other car corrals present with many unique vehicles to check out, charity autocross in the infield, featured car display — the Pontiac Trans Am, and an opportunity to drive your car on the track in the “Last Lap” tour of Portland International Raceway. 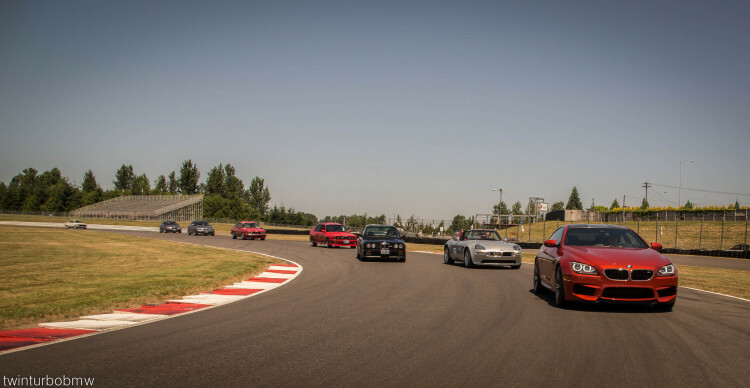 The BMW CCA Oregon Chapter Special Interest Group (SIG) will be hosting this year’s car corral and welcomes all BMWs, vintage or not, to come join us for a fun weekend at the track. As part of the CCA corral, you’ll have a chance to show off your car in the infield among many other German automobiles, be catered a delicious BBQ lunch on both Saturday and Sunday right after the parade laps, and so much more! With so much happening this weekend, you don’t want to miss this year’s SIGnature event! This year tickets must be purchased through event ticket seller Ticket Tomato. It is $45 + $3.53 in fees for a 3-day package for one vehicle and two people, which includes a car corral pass in the PIR infield. Only this package includes the Corral Pass. A few tips for completing the registration process are below and you can purchase your tickets here. If you have any questions about the event or if you’re having difficulties with getting tickets, please contact Mark Koepping. Registration may be necessary if you haven’t used Ticket Tomato before. Before clicking checkout write “BMW CCA Club” in the car club field. Very Important! Ticket and Corral Pass are printed together. Cut off the Corral Pass and place on your dash. From Broadacres Road, follow Car Corral signs through Turn 8 Gate at the NW side. The track goes hot at 8:30 AM. Openings are every 20 minutes throughout the day. Please be in place no later than 10 AM. Look for our official signage and logo: BMW CCA Oregon Chapter Car Corral. Sign up for the parade lap at noon as early as possible on Saturday and Sunday. You must sign a waiver and wear a wristband. The BBQ will be between 11:30 AM and 1:30 PM.